Rumour has it that just prior to he 2000 Summer Olympics, the City of Sydney cleaned up the streets by giving all the homeless people, drunks, and nut-jobs one way bus tickets to the Gold Coast (Australia's version of Fort Lauderdale). 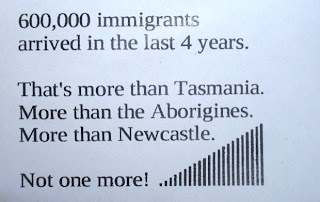 Evidently, they have finally made their way back to Sydney, for I have noticed a marked increase in the number of foul-smelling, disheveled, and mentally displaced individuals roaming the streets and parks of the city. I am an absolute magnet for such people. There is something about my face that says "Come, talk to me!" - possibly it is because I am usually staring at them in wide eyed wonder. Only recently have I begun to master the art of evasion while still managing to make a personal study of them. 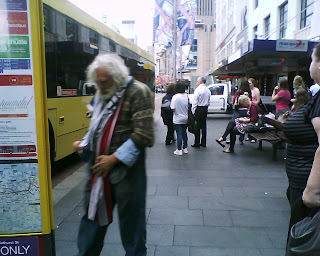 Unfortunately, I was not swift enough to get a picture of the completely feral schizophrenic that lately haunts the bus stop at Town Hall Station as he bent over into an empty rubbish bin...partly because I am genuinely scared of him and do not ever want to be the object of his fearsome focus. However, I was able to capture a (blurry) snap of this pungent character. He was draped in an American Flag with a New England Patriots T-Shirt looped over his neck. He also carried with him a small and impeccably clean crocheted blanket and entertained himself by showing a blank peice of paper to pretty girls. Somehow, I managed to avoid his attentions. I rarely talk on my phone. I type on it a lot, and since discovering it had musical capabilities, I often pretend it is an iPod. In fact, I even call it an iPod (I can hear people in England wincing.) I frequently use my phone to convert temperatures and distances into recognizable digits. Sometimes, I use it as a paper weight. Despite the protests laid in the previous paragraph, I am still daily enamored by the school children of Australia. Evidently, they travel vast distances each day to attend the best schools. Each school has a distinct uniform - presumably so that if a group of them are misbehaving, you can dob them in to the appropriate headmaster. 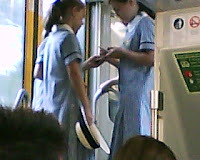 All uniforms include a hat. I am a big fan of hats and have amassed quite a collection of lost headgear from various institutions. However, I cannot help but ponder the disastrous rebellion that would have ensued had uniforms been standard policy when I was a child in America. Can anyone who knew me as a child imagine me in that drab cotton dress?? I am pretty sure they were sending text messages to each other.